That was a nice weekend off. I think MoFoing will continue to be a weekdays only type of thing for me. But it’s Monday again so on to delicious things! 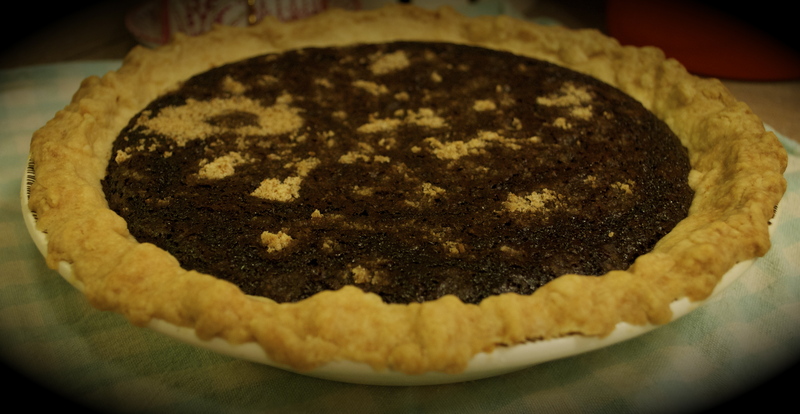 I’m told that shoo fly pie is traditional among southerners and the Pennsylvania Dutch. Quick side note, Pennsylvania Dutch is not synonymous with Amish. From what I understand Pennsylvania Dutch refers mostly to a dialect that people speak; a form of German. The Dutch part of Pennsylvania Dutch relates to the word deutsch and like many things, has changed over time. If you read further into it, you can learn all about how Germans got to be called Germans and so on and so forth and how all of this relates to Amish people. Geography mostly. Enough history and such, on to pie. I don’t remember where I had heard of this pie. I certainly have never seen one on a menu in a restaurant or eaten one. 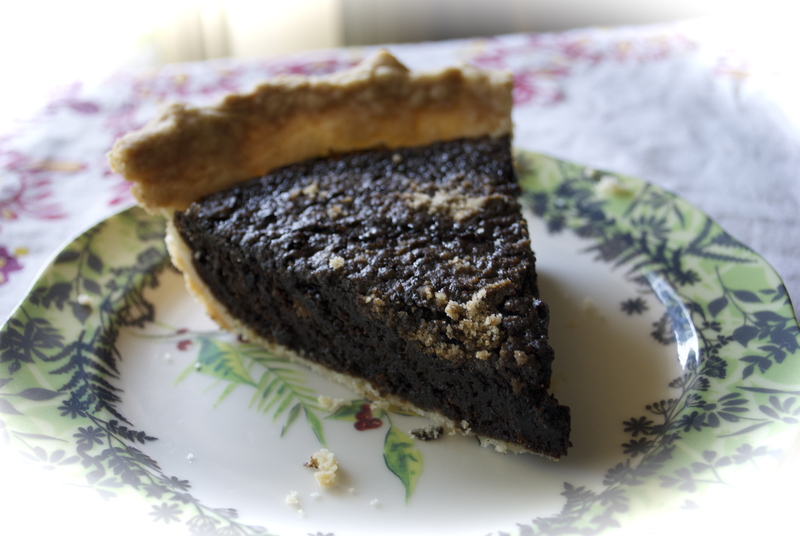 I’ve never even heard people talk about it….with one exception….I did meet a guy from Ohio who knew and loved shoo fly pie. Figures he knew what it was being so close to those Pennsylvania Dutch and all. 😉 Shoo fly pie is made primarily of molasses so I figured it would be easy to veganize. I used Wholesome Sweeteners Organic Molasses for this pie 🙂 Not only is it organic, but fair trade as well. Awesome product. I decided to do a take on this recipe by Alton Brown. I love Alton and I’m sure he would not approve of making his pie vegan (OMG there’s tofu in it) but all the same, the pie was made and it was a success. I really didn’t have to make too many changes to the original recipe, so rather than post it for you, I’m going to give you the edits. First off, I did not use Alton’s pie crust recipe, although I’m sure it’s great. I have already come to love the single (and loving it!) pastry crust recipe from Vegan Pie in the Sky. If you don’t have that book, well, how dare you. Seriously though, even if you’re already a pie master (looks at self) this book is still wonderful and you should get it. Lots of good bits of info and the recipes are good too. 1. Get yourself and single vegan pie crust or veganize Alton’s. To do that, just sub out the butter for equal part Earth Balance, sub out the lard (gross Alton!) for high quality vegetable shortening and omit the salt completely or just add a small pinch. Again, I used Isa’s crust, which was a great choice. It does have sugar in it though, so if you’re looking to not add sugar to this pie, make Alton’s or one of your other favorites. 2. For the crumbs, omit the salt and add an additional tbsp of Earth Balance for 3 total tbsp. 3. For the filling, replace the egg with ¼ c pureed silken tofu. I used extra firm—remember the key word here is silken. Use the aseptic Mori-Nu box stuff as the stuff packed in water will probably not work here. 4. Make sure you weigh the molasses. I know it says 8 oz, so you’re tempted and you just want to pour a bunch of molasses into a 1-cup measure. If you don’t have a scale, I would suggest using ¾ c molasses and seeing what happens. After reading some of the comments though, I felt like I needed to be really precise with this pie and so I weighed everything and followed instructions exactly. That’s about it. Just follow the instructions given and you will have delicious shoo fly pie in no time. Keep an eye on your pie toward the end. Alton describes how it will start to look dry and crack just a bit and that’s how you know it’s done. When my pie had that look, I took it out and I think it ended up perfect. The texture was soft, a little bit velvety and ever so slightly chewy. It holds up well the next day too. ← Vegan Garlic Cheese Biscuits aka Red Lobster Breads! The only time I’ve ever heard of shoo-fly pie is on Good Eats. I’ve never tried it before but I love molasses! When I give it a go I’ll have to give your method a shot. This looks great! I’ve been on an ice cream making kick recently and will have to make some for you pies! Oh man, good job with this one. I really despise the flavor of molasses, so I won’t be making it, but I’m impressed with your efforts (as always)!